Do I require a license? No licence is required for any air rifle or air pistol from the Airguns section of our website. All of those items within that category are below the 12 ft/lb legal limit for air rifles, and below 6 ft/lb for air pistols. However, you must be over 18 years of age to purchase and own one of these items. For everything within the Shotguns and FAC Rifles category, a valid Shotgun Certificate, or Firearms Certificate is necessary, which will need to be emailed to enquiries@londonarmoury.co.uk. Please ensure that your relevant certificate is emailed to us as soon as possible after ordering, as any delay could result a delay in your delivery. What I.D is required to buy an air rifle or airgun? You must produce a form of I.D. that includes your photo, name, date of birth, and current address - for example a photocard driver's licence, passport with recent utility bill. What happens when the Delivery Driver turns up with my goods? We will always contact you before delivery to ensure that you are around for the time that we have scheduled. When the driver does arrive at the arranged time he will ask to see your proof of ID, which for an airgun will be either a driving license or a Passport with a Utility Bill, and for a Shotgun or Firearm he will need to see the relevant certificate. After checking your ID, he will ask you for a signature in the Firearms Register to confirm that you have received the item, and for a Shotgun or Firearm he will also need to complete the relevant paperwork to reflect that addition to your certificate which will take a bit longer. After all the necessary paperwork has been completed, he will then hand over your goods for you to unpack and cherish. Why do you assemble my items? First and foremost, we believe in quality. We believe in checking every component that we send out, and that means making sure that the scope fits the mount which fits the rifle, and they are all in perfect working order. We make this part of our Quality Assurance commitment and we steadfastly believe in it. If you are an enthusiast like us, and want to assemble your own air rifle, simply uncheck the box at checkout and look forward to your delivery! Do you only stock what's on your website? If you don't see what you want on our website, then give us a call. We try and put everything we supply on the website, but our stock is always changing, suppliers are always bringing out new items and we will always do the best we can to help you. This summary is taken from content provided by the British Association for Shooting and Conservation. NEVER POINT ANY RIFLE, LOADED OR UNLOADED, IN AN UNSAFE DIRECTION. It is estimated that there are over six million air rifles in England and Wales, the vast majority of which are used in a safe and responsible manner. This code offers guidance to those who shoot with them. It does not apply in Northern Ireland where separate firearms laws apply. Above all, safety is the most important consideration. Always know where the muzzle of your air rifle is pointing and NEVER point it in an unsafe direction. Whenever you shoot, make sure you know where the pellet is going to end up before you pull the trigger and ensure there is a safe backstop to capture the pellet. On picking up or receiving an air rifle, check immediately to ensure that it is uncocked and that there is no pellet in the breach. Pay particular care when checking pre-charged pneumatic (PCP) air-rifles. - buy or hire an air rifle, or ammunition, or receive one as a gift. Your air rifle and ammunition must be bought and looked after by someone over 18 – normally your parent, guardian or some other responsible adult. - have an air rifle in a public place unless you are supervised by somebody aged 21 or over, and you have a reasonable excuse to do so (for example, while on the way to a shooting ground). - use an air rifle under supervision on private premises with permission from the occupier - normally the owner or tenant. The person who supervises you must be at least 21 years of age. - buy, hire or receive an air rifle or its ammunition as a gift, or shoot, without adult supervision. Where you intend to, always ensure that you are authorised by the landowner or person with the sporting rights and that you know precisely where the boundaries are. Get permission in writing, if possible, to remove any doubt. Going on to private land, or water, where you do not have permission is trespassing, and if you are carrying an air rifle it becomes armed trespass. Whether the gun is loaded or not, or whether you are carrying pellets, is irrelevant – armed trespass is a serious criminal offence carrying heavy penalties. It is an offence to fire an air rifle pellet beyond the land where you have permission to shoot, unless the occupier of the neighbouring land has also given you permission. Where someone under 14 is shooting, both the young person and the supervising adult can be prosecuted. It is also against the law, in England and Wales, to fire an air rifle within 50 feet of the centre of a highway if this results in someone being injured, interrupted or endangered. These offences could be committed, for example, when someone is shooting in their garden close to a road and the pellets ricochet onto the highway. It is an offence in Scotland to discharge any gun in a culpable or reckless manner. This means shooting without caring about the safety of others. There are numerous clubs catering for this growing sport, throughout the UK, and they can offer great help and shooting opportunities to both the novice and the experienced shooter alike. You will find contact details on Go Shooting and on the Shooting Club Directory. If you want to practice on your own premises make sure that you have an effective backstop. Soft earth or chipboard is ideal, but don’t use any hard, polished surface because it is likely to cause a dangerous ricochet or could cause the pellet to rebound and hit the shooter. • MAMMALS: brown rats, grey squirrels, stoats, mink and rabbits. All birds are protected, and although there are seasons when you can legally shoot game, and some wildfowl, they are not suitable quarry for air rifles. However, as long as you are complying with firearms law, you can shoot certain pest bird species. These are covered by open general licenses which, in simple terms, mean you can shoot the birds listed, provided you have the landowner’s permission and provided you are doing it for one of the reasons allowed by the license. BASC recommends that anyone wishing to take bird pest species should read BASC’s advice on general licences . Always shoot well within your capabilities. Practice on targets, never on live quarry, to establish the maximum range at which you and your rifle can consistently hit the point of aim that will ensure a clean kill; this is usually the head, and normally has a maximum diameter of about three centimetres (an inch and a quarter). Practice regularly to improve your shooting and stalking skills. Make sure you know where the kill zone is for each species that you are going to hunt. For mammals the side-on head shot is the preferred target. For birds, head shots are effective but difficult because the target area is very small and rarely holds still. Shots to the breast or body cavity give a bigger target area but remember that dense feathers or a crop full of grain will limit the pellet’s effectiveness. The area under the wing is a good place to aim for. You must zero your rifle and sights (check their correct alignment) before starting any hunt; usually a rifle-scope will come with instructions on how to do this, otherwise there are many books which explain the principles. Always dispatch wounded quarry quickly to minimise suffering, either with a second shot or a sharp blow to the base of the skull. Be particularly careful when dispatching wounded rodents – they can bite and scratch with a risk of serious infection. DO NOT TOUCH RATS. They may carry fatal diseases, so you should lift them with a fork or shovel. 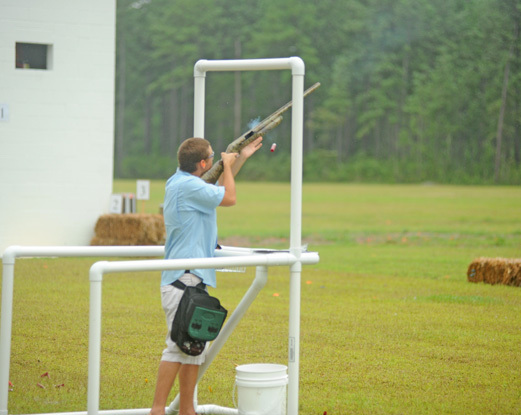 Certain types of air rifle are more suitable for hunting than others. Avoid those air rifles which take excessive time to charge, load and fire. Repeating air rifles give an immediate second shot which is always an advantage. All air rifles must be well maintained in accordance with the manufacturer's recommendations. If in doubt - consult your local dealer. Choose pellets which are designed for hunting. These will produce cleaner kill than those which are intended for target shooting. Check every pellet before loading to ensure that it is not damaged or deformed. • Always check with the landowner, in good time, if you want to go shooting. • Always confirm with the landowner what quarry you may shoot. • Always respect the owner's property, crops, livestock and fences and follow the Countryside Code (http://www.countrysideaccess.gov.uk). • Always treat an air rifle as though it is loaded and keep its muzzle pointing in a safe direction. • On picking up or being handed an air rifle, check immediately to ensure it is not loaded e.g. that it is uncocked and that there is no pellet in the breech. Be particularly careful when checking pre-charged pneumatic air rifles. • Before you fire your rifle, consider where the pellet could go. Be sure that no damage can result if you miss your intended target. • Always bear in mind the possibility of a ricochet. • Never put down a loaded air rifle or leave it unattended. • Use of a silencer can minimise disturbance to wildlife, livestock and other countryside users. Remember that all shooters will be judged by your actions and ensure that your conduct is always above reproach. Encourage the same attitude in your shooting companions. Above all, be safe and be sensible. Always leave your shoot in the condition in which you would like to find it. Make sure that you collect all your equipment. It is courteous to thank the landowner and to offer him something from the bag if you have shot any edible quarry. Take care of your edible quarry – remember it is food, store it in a cool place and never waste it. Non-edible quarry should be disposed of discreetly, carefully and should not create a health hazard. This is a legal requirement. Under most circumstances deep burial beyond the reach of a carnivorous animal would be appropriate. Take care of your gun; it is a precision weapon and damage or mistreatment can seriously affect its performance and safety. Do not attempt to strip an air rifle without having the proper tools, facilities and knowledge to do so safely. Many air rifles contain powerful springs which can cause serious injury if released in an uncontrolled manner. After shooting, ensure your air rifle is dry and free from dirt before storing it. Metalwork may benefit from a wipe down with a lightly oiled rag or a silicone cloth. The barrel should be cleaned using a proper barrel cleaning kit, and again lightly oiled. Only use the correct lubricants in accordance with the rifle manufacturer’s instructions. Always carefully wipe the oil from the bore before shooting. That all who shoot in Britain conduct themselves according to the law and to the highest standards of safety, sportsmanship and courtesy, with full respect for their quarry and a practical interest in wildlife conservation and the countryside. Never guess at what the law allows. If in doubt, contact BASC or your local police firearms licensing department. Revised July 2015 in association with ACPO. BASC gratefully acknowledges the endorsement of this code by the Association of Chief Police Officers.